Mr. Lawrence Dimech, during his opening speech. 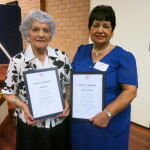 The importance of volunteering was paramount in the minds of the organisers when they presented the 16th Annual Quiet Achievers Night of Recognition at the Annunciation Hall situated at St Dominic’s Age Care Facility in Blacktown NSW. 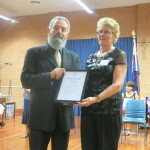 Eleven more persons from across NSW were honoured for their contribution to the general community as volunteers. 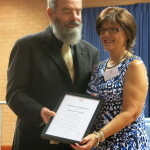 To receive this much treasured award you have to be over 60 years old, not having been honoured before by Government instrumentalities and a resident of NSW. 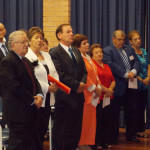 Lawrence Dimech, the President of The Maltese Welfare (NSW) while praising governments for their assistance to aged and persons with lifelong disability said certain initiatives fall short and may not be culturally specific enough therefore, some duty of care becomes part of our responsibility. He made a strong appeal for more volunteers saying “We can make a contribution to lessen the suffering of others; making a contribution and making a difference, they should be linked. It is something that everyone can do in their own life”. 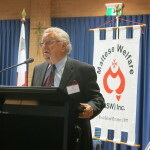 Assoc Professor Stephen Gatt, the Chairman of the Board of St Dominic’s spoke highly of the contribution of Maltese Welfare to the Maltese community while remembering that when he migrated to Sydney he was the recipient of valuable assistance that was important in a new land for all this family. On behalf of Maltese Welfare he also presented to each and every person honoured on the night with a framed inscription as a memento. Sister Giorgina Sultana, the superior at St Domenic’s was thanked for her assistance and presented with a bouquet of flowers. 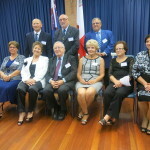 Amongst those honoured was Vittoria Teuma a 90th years old Gozitan that was described as a shining example of perseverance in hardship and resilience, typical of her generation. 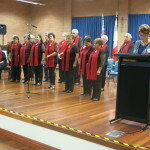 The others were Josephine Bugeja from Girraween, Felicity Gravina from Kings Langley, Antoinette Mangion from Blacktown, Mary Rose Muscat from Seven Hills, Mary D. Pocock from Kellyville, Liliana Taliana and Edward Vella from Greystanes, Jane Vella from Wentworthville, George Zahra from Glenwood and Jerry J Zarb from Bateau Bay. 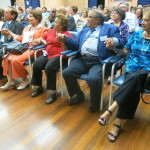 Marlene Dimech & Frances Montesin explained to the audience both in English and Maltese why each person was nominated. Nathalie Gatt was the MC reminding all that this annual event is made possible by the assistance received from the Fiducian Financial Service.. The first part of this celebration was taken up by a very entertaining performance by the Choir of the Maltese Cultural Association under the direction of Marisa Previtera singing popular Maltese and English song, very much appreciated by all.